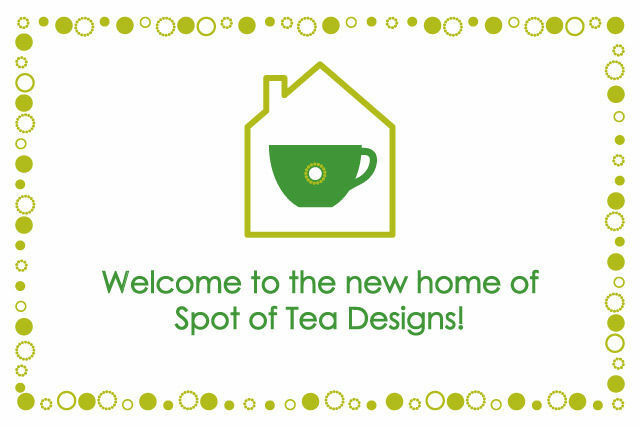 Welcome to the new home of Spot Of Tea Designs! This Christmas season I finally took the leap and treated myself to something I’ve been toying with for about a year: to move to a self-hosted format. “What does self-hosted mean?” I used to blog on a free WordPress.com site, which is great for beginner bloggers but I was soon finding some limitations. There was some visual stuff I wanted to do to make my posting process a little faster and I wanted to be open to the option of working with brands, companies and shops through promotions and advertising. With the help of the team at Pauselius (Hi Darice! ), I now pay to have my site hosted and am no longer under the restrictions of WordPress. “What’s going to be different?” Well, not much will be changing as far as my content goes. I hope that if and when I do get in contact with more brands, companies, and shops it will benefit you with the knowledge of new information and inspiration (and maybe a giveaway or two down the road). Otherwise, hopefully there are some visual tricks within my website (like that nifty “Related Posts” section at the bottom of my posts) that you will enjoy! “Oh, so you’re gonna sell out, huh?” NOPE! I don’t plan to get bitten by the evil greedy monster of blogland! I want to connect with different people that will help me become more creative and inspire others. I promise that any product, shop or brand I promote here is something I would personally use and stand behind. I do not want to lead anyone astray for the sake of a few bucks. I plan to disclose any outbound links mentioned in my posts as affiliates or sponsors. You can find my full updated disclosure policy here. all the blog followers I that forward, pin, comment, tweet and help promote my posts. I love reading all your comments and hearing that they have inspired you. I’d love to do a “reader’s feature” later this year with some examples of crafts people have made which were inspired by one of my posts! Contact me! my active contributors, especially my bestie Alliecat, who patiently puts up with all my questions and pleas to share their creative talents online! my other creative friends who have given me and my family handmade gifts! the other bloggers who host linky parties I participate in or share my content in other ways. Derek, my husband, and Brielle, my daughter, who support me and my blog through physical dedicated time or patience when I need 20 angles of the same shot to make sure one will work for the blog. Best wishes with this new endeavor, at least new as to the format! Miss you!